The 2nd Samnite War broke out in 327 BC over the disputed province of Campania. The Romans suffered one of their worst military setbacks at the Caudine Forks in 321 BC when a double consular army was surrounded and forced to surrender. 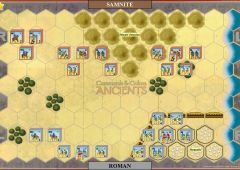 The Samnites were then able to impose a 5 year truce. The Romans used the lull to strengthen their army and hostilities broke out again in 316 BC. 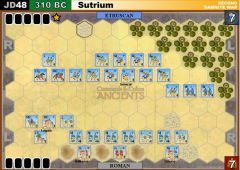 The Romans invaded Samnium with the Dictator Quintus Fabius Rullianus and the Master of Horse Quintus Aulius each commanding a double legion of about 9,000 troops. Fabius moved inland while Aulius advanced down the coast. 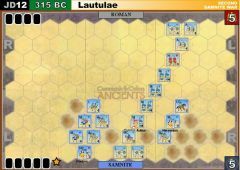 The Samnites only had about 7,000 men, so their commander Pontius set an ambush for Aulius at the Lautulae pass where he hoped to destroy one of the Roman armies. Aulius failed to scout ahead properly and the head of his column was attacked from both sides of the pass. Aulius died trying to organise his men to break through and then his army routed with only a few hundred surviving. The war would drag on until 304 BC when after a series of Roman victories the Samnites were forced to sue for peace. The matter would not be finally settled until the 3rd Samnite war. 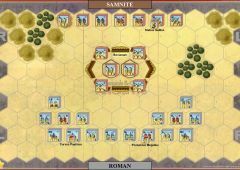 Due to surprise all 1st turn Samnite attacks gain 1 dice and all Roman units will battle back with 1 less dice. 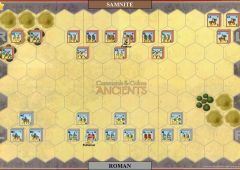 On the 1st Samnite turn the Roman player may not play "First Strike". NOTE:- The Romans are travelling in column and are not prepared to receive an attack. 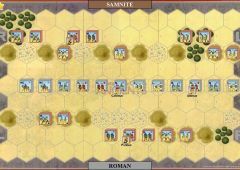 Session report: Samnite's lost to a massive two-turn game changer. 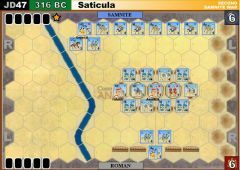 After a careful battle from both sides, Samnites pushed center map with a leader-supported four unit front of 2 hvys, 2 meds against a weaker Roman line. But some tragically lopsided dice rolls left their heavies in worse shape than the Romans. 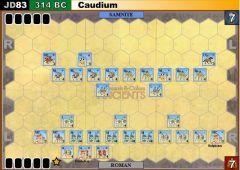 On the Roman's counter, they played a brutal Clash of Shields that rewarded 3 banners in a single final turn to steal the win.